In the sewers beneath 49th Street, the Turtles are having trouble navigating. Suddenly, Raph hears Metallica’s “Master of Puppets” echoing from somewhere in the sewers and follows it. 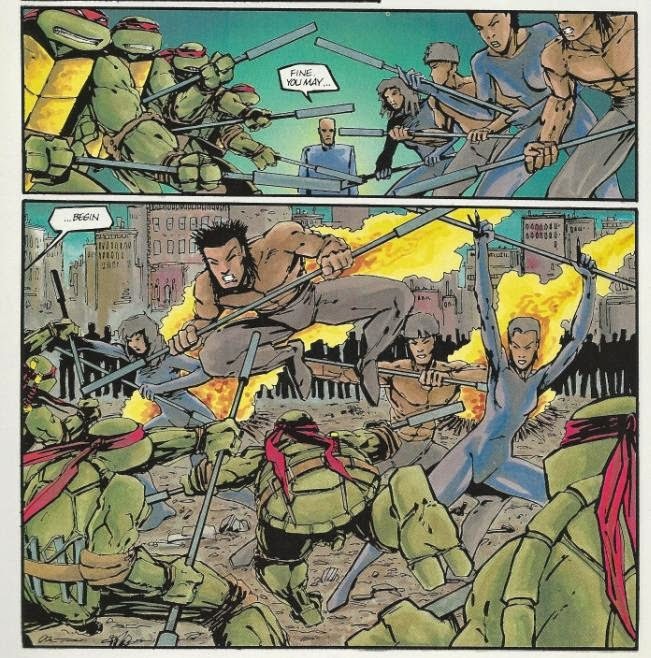 The Turtles stumble upon a massive gang meeting full of thugs with an axe to grind. The grungy leader expositions that some big time boss has been organizing all the gangs in the Projects into a single, unified force. They’ve been invited to a “meeting” over at the Wasteland where they’ll be issued an ultimatum by the unified gang: “Join us or be destroyed”. The grungy leader isn’t having this and proclaims that they’ll show up to the meeting, but they’ll be ready for war. The Turtles split, hoping to stop this gang war before it begins. 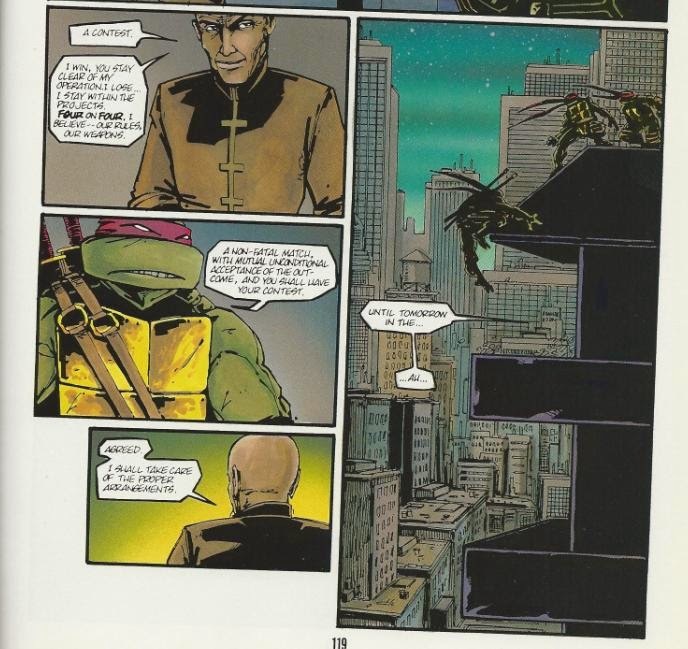 The Turtles head to the Projects and after asking the right questions to the right people, they find the (upscale) building housing the big time boss behind the gang unification. While his brothers wait on the roof, Leo drops into the penthouse to visit the boss. The boss isn’t especially surprised to see Leo, as he has several connections within the Foot Clan. Leo explains that he represents a third party that doesn’t wish to see the unified gang from the projects invade other territories. The boss offers a contest: four on four, if his gang wins then Leo must steer clear of his operation from now on, but if Leo wins then he will remain within the projects. Leo agrees to the terms and promises to meet him in the wasteland tomorrow night. The next night, at the Wasteland, all the gangs have shown up, ready to fight. The boss of the unified Projects gang summons his four ninja while the grungy leader of the separatist gang is prepared to throw down full force. Suddenly, Leo and the Turtles emerge and Leo offers to fight on behalf of the separatist gang. The grungy leader disagrees until Leo subdues him and forces him to concede. Leo then introduces his “gang” as “the 49th Street Stompers”. With that out of the way, the boss of the unified gang issues the weapons of the match (padded staffs) and announces the rules (whoever is knocked off their feet is disqualified, last man standing wins, no deathblows allowed). The Turtles then face off against the quartet of ninja. Very quickly, three of the ninja and three of the Turtles are knocked down, leaving only Leo to fight against a lone female ninja in a silly full-body purple latex getup. Leo outmatches her, breaking her staff in two. Enraged, the ninja attempts to stab him with the pointed end of her broken staff. Leo effortlessly flips her onto her rear, winning the match. The match over, the boss of the unified gang admits defeat and promises to restrict his operation to the Projects... for now. He muses that perhaps they’ll meet again someday as the Turtles split the scene. *This story was originally published in color. It was reprinted in black and white for the “Shell Shock” TPB. 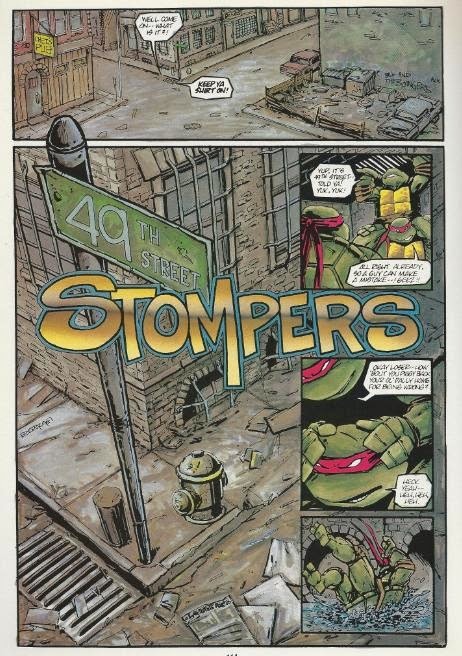 It was eventually reprinted in its original colors for the “TMNT 25th: A Quarter Century Celebration” trade paperback. *The lettering between the First Comics and “Shell Shock” editions remains identical save for one odd exception; on page 8 of the “Shell Shock” version, the unified gang leader’s dialogue is changed from “Come forth ninja” to “Come fourth, ninja”. This fixes a punctuation error whilst adding a spelling one in the process. We appreciate the thought, though. *For the “TMNT 25th” reprint, the colors appear to have been darkened a bit to make the presentation muddier and slightly “grittier”. *CHET ALERT: “Chet’s Pub” appears in the first panel of the first page. The name “Chet” was a running gag in the original TMNT comics as the creators… just liked that name. *The “Lavigne Post” seen littering the streets is obviously named after Mirage staffer Steve Lavigne. The guys at Mirage pumped out a slew of back-up shorts for the TMNT, but only a handful of them ever had any consequence to the ongoing Turtles storyline. Often times, some of my favorites, the ones with the most story potential, simply never went anywhere. Such is the case with stories like “New York Ninja” and “49th Street Stompers”. In regards to “49th Street Stompers”, it set up an interesting glimpse at the struggling underworld of New York, taking the focus away from the Foot for a change. It comes off as a bit of a tease, introducing us to all these gangs and unique members and leaders, but never offering any specific names. A real shame, as they seemed to be trying to go somewhere with this storyline, too. You’d think that a single mastermind unifying all the gangs of New York into a massive army would have major repercussions for the TMNT, who encounter gang violence on a daily basis. Guess not. Art and story-wise, it’s more of Eastman’s gritty, street-level stuff that I tend to prefer over Laird’s wacky outer space and sci-fi hijinx. Eastman’s pencils are excellent, forgoing some of his typical issues (such as too many panels crowding a page or goofy circle-eyed expressions of the Turtles). He’s the master of “trash-strewn allies”, anyway. Unfortunately, Eastman falters in the same manner he so often does, writing every Turtle like they were Raph. Leo cracks wise way too much, using a lot of ridiculous slang he’d never say under any other writer (“chill out, bub” for example). Between the color and black and white editions, I actually prefer the latter. Lavigne's colors are just way too vibrant, even after being muddled for the “TMNT 25th” reprint, and I just can’t take a purple latex bodysuit seriously. The black and white version is darker and moodier, giving the story an entirely different atmosphere. On its own, “49th Street Stompers” doesn’t amount to much; just a Metallica reference that ends in a brief tournament match. It’s more the taste of “what could have been” that makes this story stand out over many of the sillier TMNT shorts that never went anywhere or served any purpose other than a quick yuk.